Cactus is a naturally spawned plant in desert biomes. When broken, cactus drops itself. A cactus can be placed on sand or another cactus. 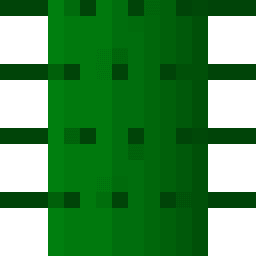 Cactus will break if there is a block next to it, or if it's not on top of sand or another cactus block. It is renewable, as it can grow. When planted on sand, it will grow up to 3 blocks tall. If the player tries to walk through a cactus they will take damage, unless they are crouching. All mobs will take damage if they collide with a cactus. Unlike lava, cacti do not destroy items, so you can pick up a mob's loot after they are killed. A cactus can be smelted to give a green dye. This page was last edited on 28 March 2019, at 17:05.